Smoked salmon is a great ingredient to keep around for quick and easy meals, but it seems special enough to serve with wine (unlike, say, turkey from the deli). I like a dry Riesling with this maki roll–inspired rice bowl: It’s a zippy counterpoint to the rich salmon, almost like a squeeze of lemon or lime. If you have already-cooked brown rice, this recipe comes together in just a few minutes. 1. In a small, heavy saucepan, combine the rice with 1 cup of water and a pinch of salt and bring to a boil. Cover and simmer over low heat until the rice is tender and the water is absorbed, about 40 minutes. Remove the rice from the heat and let steam for 10 minutes. 2. Meanwhile, in a small bowl, toss the cucumber slices with the sugar and 1/4 teaspoon of salt. In another small bowl, toss the avocado with the lemon juice. 3. Scoop the rice into bowls. 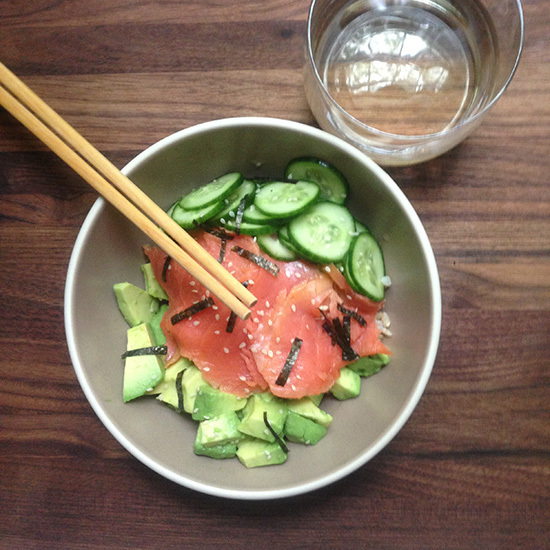 Arrange the cucumber, avocado and smoked salmon on top. Sprinkle with sesame seeds and strips of nori and serve. Wine A zippy dry Riesling, like 2012 Clean Slate. One serving 351 cal, 17 gm fat, 2 gm sat fat, 39 gm carb, 8 gm fiber, 13 gm protein.